Kala Gallery is proud to present Para-Apparatus, featuring new work by our 2013-2014 Fellowship artists: Brian Barr, Ben Bigelow, Tammy Rae Carland, Andrew Connelly, John Davis, Corey Escoto, Amy M. Ho, Cybele Lyle, and James Sterling Pitt. The exhibition presents new work created during the Fellows’ studio residencies in a wide array of media and processes including site-specific mixed media installation, sculpture, performance, photography, sound and video. Each of these artists creates his/her own unique apparatus to present his/her work transforming the given space into unexpected encounters. Different components in each installation such as colors, lights, sounds, and architectural elements generate magical compositions of in/visible music. Kala Fellowships are awarded annually to nine innovative artists working in printmaking, photography, book arts, installation, video and digital media. 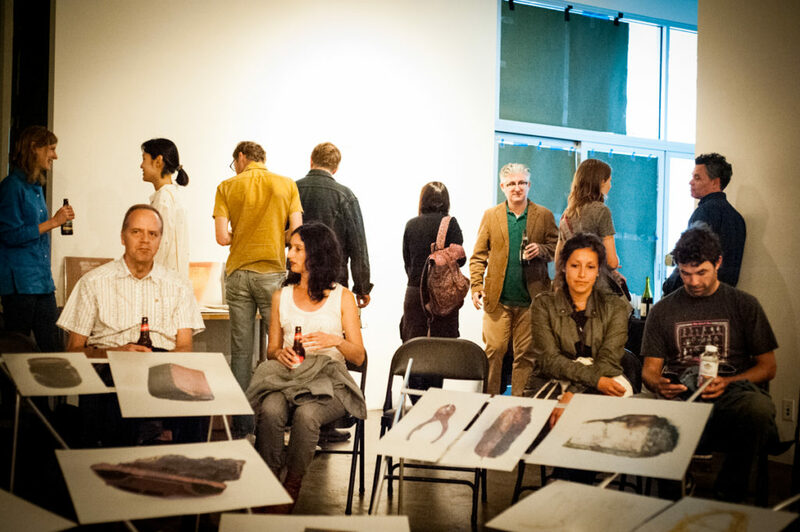 Fellowship artists are selected from a competitive field of applicants from around the globe. Recipient artists receive a financial award and up to a six-month residency at Kala’s studio facility followed by an exhibition of their new work. These nine Fellowship artists were selected by a Kala Selection Committee with two guest jurors: Tanya Zimbardo, Assistant Curator of Media Arts at the San Francisco Museum of Modern Art, and Chris Duncan, artist and alumni of the Kala Fellowship program. Through the lens of living in Detroit, Brian Barr examines images of Western culture as ephemera from historic moments. He creates large-scale collage installations exploring the possibility of imagery – how it can signify shifting social phenomenon. By taking his work outside of the context of Detroit, Barr hopes to engage in new discussions, as well as create a link between the current economic, social and political climate of Detroit with the country at large. His work was featured in Totems at Vox Populi in Philadelphia and the national publication, New American Paintings. Barr is the founder and Director of Passenger, a residency program and Center for Contemporary Art in Detroit set to open in 2015. Ben Bigelow uses abstraction as both his subject and strategy for thwarting the inherent reproducibility of digital media. In his video piece, the window blinds open and close at a speed where movement is just visible. When they reach one end, simultaneously, the blinds oriented in the inverse direction open making an infinite loop. Using custom software that updates the video live, the color combinations are mathematically infinite and will never repeat the same color. The video piece accompanies screen-shot polaroids of a still life setup in a 3D animation program. Bigelow received his MFA from Stanford University and his BFA from Carnegie Mellon University. His exhibitions include the Royal NoneSuch Gallery, Oakland, CA; Campbell Hall Gallery, Los Angeles, CA; and Harlem Factory Fest in New York, NY. His videos were recently on view as part of Open Video Call at the Institute of Contemporary Art, Philadelphia. Tammy Rae Carland presents Discogram, her unique photograms made directly on photographic paper with the moving disco mirror ball in the darkroom. Accompanied by a photo-polymer print paired with a mirror and two prints of vinyl cover jackets, her work explores the affinities between live performances and still images. Tammy Rae Carland received her MFA from University of California Irvine and her BA from The Evergreen State College in Olympia, Washington, and attended the Whitney Independent Study Program in NY. She is an Associate Professor at the California College of the Arts. Her work has been screened and exhibited in galleries and museums internationally including New York, Los Angeles, San Francisco, Berlin and Sydney. Her photographs have been published in numerous books including The Passionate Camera; Queer Bodies of Desire and Lesbian Art in America. Andrew Connelly works in sculpture, installation and performance. For Para-Apparutus, Connelly creates Depression, a photo installation with a collection of studio photographs of burnt objects found after the fire at his house in 2006. Combined with the contrasted images that signify life in the swell, the photographs sustain a collective identity relative to beauty, loss and destruction. Connelly received his MFA from University of Colorado, Boulder and his BFA from New York State College of Ceramics, Art and Design at Alfred University, Alfred, NY. Connelly is an Associate Professor at California State University, Sacramento, CA. His work has been shown nationally and internationally at venues including Center for Contemporary Art Sacramento, CA; Delaware Center For The Contemporary Arts; China Central Academy of Fine Arts, Beijing, China and more. Long, Collin McKelvey, Vanessa O’Niell, Maggi Payne, Thad Povey, Andy Puls, Andy Roche, Jeremy Rourke, Mark Taylor, Tooth and Mark Wilson. Schedule TBD. Texas-born, Pittsburgh-based artist Corey Escoto presents a site-specific installation with a series of handcrafted Polaroid photographs and corresponding sculptures that use the images as their structural blueprint. He manipulates his Poraroid images all in camera by inserting hand cuts light-blocking stencils that allow sections of the film to be exposed selectively. His work examines the interplay of surface and materials, and the relationship between natural and simulated elements. Escoto received his MFA from Washington University in St. Louis and BFA from Texas Tech University. He has shown widely nationally and internationally, with selected solo exhibitions at the Contemporary Art Museum St. Louis; Regina Rex, Queens NY; and an upcoming exhibition at the Carnegie Museum of Art in Pittsburgh, PA, and more. Amy M. Ho builds video and spatial installations that bring attention to our existence as both physical and psychological beings. In her large-scale spatial installations, viewers become aware of their reactions to her illusionary space. Her work delves into parallel spaces, specifically looking at how we inhabit fictional spaces and how we experience real spaces. Ho received her MFA from Mills College and her undergraduate degree in Art Practice from University of California, Berkeley. 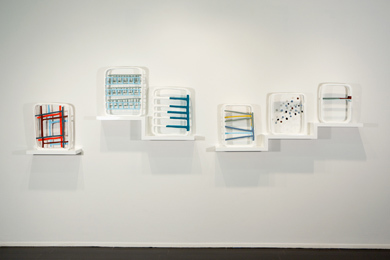 She was selected for the ProArts Gallery 2×2 Solos series in 2012, and is a recipient of a San Francisco Arts Commission Individual Artists Grant for 2013. She will be participating in a residency program at Studio Kura, Japan in 2014. She currently works and lives in the Bay Area and is represented by Chandra Cerrito Contemporary. Cybele Lyle explores the relationship between the 2 dimensional world of photography and the physical world. She constructs new spaces editing out existing elements from the surrounding architecture and natural environments. In her work, interior and exterior are inverted, challenging the assumed roles of private and public and creating an alternative environment in which all forms of intimacy are allowed to be visible. Lyle holds her MFA from Hunter College in New York, where she received the Tony Smith Award upon graduating. She received a BFA in printmaking in 2001 from California College of the Arts. Cybele has been an artist in residence at the Bemis Center, Atlantic Center for the Arts and Ox-Bow. She was selected as a finalist for the 2012 SECA award from San Francisco Museum of Modern Art. James Sterling Pitt records his experience of a time and place in a drawn sketch, and then converts it to sculpture referring to his personal memory of the experience. During his residency at Kala, Pitt collaborates with musician Danny Paul Grody. Choosing specific destinations, such as Mineral Springs in Tilden Park, Battery Townsley in the Marin Headlands, his studio at Kala, they collaboratively record their time together in sound and image format (drawings/paintings/prints). Taking these recordings back to their respective studios, they reflect and build on this collaboration. For Para-Apparatus, Pitt presents their creative process as a studio setting in the gallery space. This process will culminate in a live performance at Kala Gallery on Saturday, June 21 (the solstice). The final work from the collaboration will result in a LP/Print Release by Land and Sea in Late Summer/Fall 2014. Pitt received his MFA from Mills College and his BFA from University of New Mexico, Albuquerque. His work has been shown nationally and internationally. Pitt’s work is represented by Gallery Paule Anglim, San Francisco, CA.